Paul Pollock will lead an Irish team which includes two other Ulster athletes in the European Championship marathon in Zurich this August. Pollock, aiming for an individual medal, is joined by St Malachy's pair Kevin Seaward and Tomas Fraizer, along with Dublin marathon winner Sean Hehir. Pollock secured the Commonwealth Games 10,000 qualifying standard last Sunday. The Holywood man was an automatic selection after finishing the second European at the World Championships. Kevin Seward and the Chicago-based Frazier did not gain the A standard for Zurich but were selected after good performances in the Manchester and Dublin marathons. It will be the first time Ireland have entered the Marathon Cup, a team marathon competition run in conjunction with the marathon at the European Championships. Results are based on nations' three fastest finishers. "I am delighted to have it confirmed," said Pollock from his base in California where he is preparing for the Commonwealth Games and European championships. "It is great to have three Northern Ireland guys on team, I really think we can sneak a team medal in Zurich. "Going as a team is great and to have Kevin, Tom and Sean Hehir in the mix, I think we can all run a bit faster." 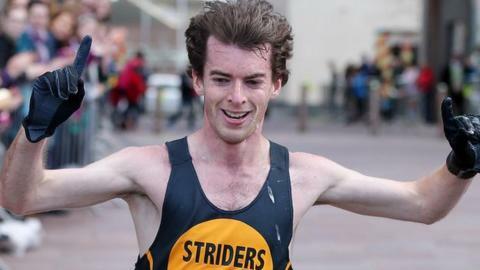 The door may be open for a surprise Irish team medal as many of Great Britain's marathon team are focusing on the Commonwealths in Glasgow. "Of the guys that will probably make the GB team, I think we can at least equal them," added Pollock. "I was hoping to run under 28 minutes but I lost it at about six kilometres so I was happy to keep my performance together. "I am happy with where I am at currently. Altitude training in California is going well and I think I will have a big summer." The members of the Irish women's team for Zurich include Maria McCambridge (Dundrum South Dublin AC), Barbara Sanchez (Clonliffe Harriers AC) and Claire McCarthy (Leevale AC).